V.Group senior executives held a series of high-level meetings in China week commencing 12 March to progress the company’s ambitious growth plans in both the commercial and leisure shipping segments. The tour included meetings with key players in the industry – from leasing houses to ship builders and crewing providers to state owned enterprises operating in the marine industry in China. On Thursday 15 March, V.Group had the honour of a courtesy meeting with Mr Weng Zuliang, Party Secretary of Pudong Government, and a number of his senior colleagues. The meeting gave Ian the opportunity to share V.Group’s long-term commitment to China and plans for continued investment in Pudong specifically. Pictured above: Mr Weng Zuliang (centre), with Ian El-Mokadem, V.Group’s CEO to his right and to his left, Haris Kyriakopoulos (Advent International Director and V.Group Board Member). Also from V.Group – from second left, Alex Bilokon, General Manager V.Ships China, Alastair Evitt, Group Managing Director, Ship Management East and Martin Gaard Christiansen, Chief Commercial Officer. 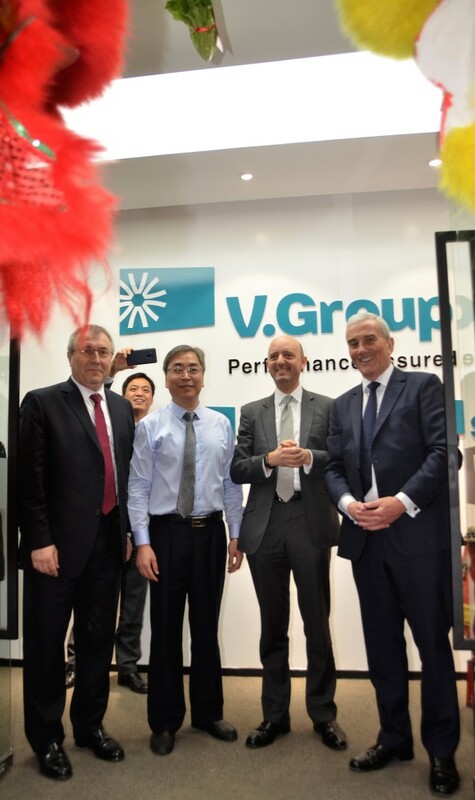 Mr Weng thanked the company for choosing the Pudong District of Shanghai as the location for V.Group’s head office in China and pledged support to the Group’s future growth plans. The week-long visit culminated in a customer reception to formally open the new Shanghai head office, which is located in Pudong’s high-profile Marine and Finance Excellence Centre. Hosted by Ian and V.Group’s Chairman, John Pattullo, it provided further opportunity to highlight the Group’s commitment to growth in China. 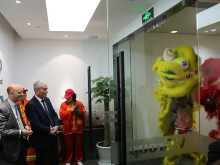 The office opening was supported by lion performers, a Chinese tradition to give our new office strength and good fortune. Pictured above welcoming the lions into the new office (l-r): V.Group's Alex Bilokon, Chu Liping, Ian El-Mokadem and John Pattullo. V.Group’s new Chief Executive Officer, Ian El-Mokadem joins the organisation today. Ian brings a wealth of experience in leading and growing customer focused, international service businesses, and his arrival marks a significant milestone in the Group’s ambitious transformation plans.